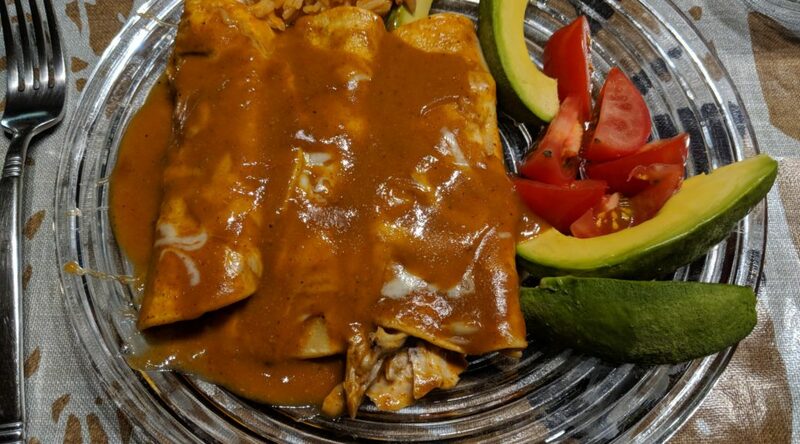 When we're craving the Mexican food of Southern Colorado, this is the dish that hits the spot. in a skillet (onions should be on the bottom). Bring to gentle simmer, let cook covered until chicken is cooked through, 30 minutes or so. If necessary, add water as it cooks. Remove from pan when done; let cool and shred chicken. Reserve the chicken stock. Feed the onions to Evan. Traditionally this is done by dipping them a saucepan filled with lard, but we prefer to put them in the microwave for a few seconds, until soft. Using tongs, dip each one into the sauce, fill with chopped lettuce (we omit), finely chopped onion (about a teaspoon, or to taste), shredded chicken meat and a tablespoon of the grated cheese. Place the filling slightly off-center and roll up to form a cylinder. Place these into a non-stick baking pan. When the pan is full pour more sauce on top and cover with additional grated cheese. Heat in 350° oven to warm food through and melt cheese, about 8 to 10 minutes. Serve with Sadie’s Spanish Rice and refried beans.